Brisbane (then known as Moreton Bay) was originally settled in 1824 by New South Wales's worst prisoners and the soldiers to guard them, all sent forth from Sydney in a bid to reduce that settlement's high crime rate. It was not until 1838, some fourteen years later, that the first free settlers arrived in the form of about twenty German missionaries who were encouraged by Rev JD Lang to come to what must have been a very inhospitable setting. These pioneers established their mission at a place they called Zion Hill on a grant of land furnished by the New South Wales government. It was situated between Brisbane Town and Eagle Farm, the area used to grow crops for the settlement. There was a stream that provided water for the settlers, and they named it Kedron Brook which, like Zion Hill, was a biblical reference. The place became known as German Station and is now the near-city suburb of Nundah. Unfortunately for these hardy souls the settlement could not sustain itself and the missionary work was hardly successful. The settlement was terminated in 1843. After that, the Zion Hill settlement was allowed to run down, although many of the pilgrims remained in the area on individual plots. Around them grew an industrial and then a farming area and a small portion was declared a water reserve to be known as Kalinga Park. In 1910 it became a sporting venue, and then, following the harrowing years of WWI, a set of memorial gates were erected at the entrance to the park in remembrance of local men who gave their lives in the war. The gates were dedicated in October 1920, and here is a photograph of the guard of honour formed by the local Boy Scout troop at the ceremony. The impressive portal can be seen behind them. For a time the area became known as Anzac Memorial Park. 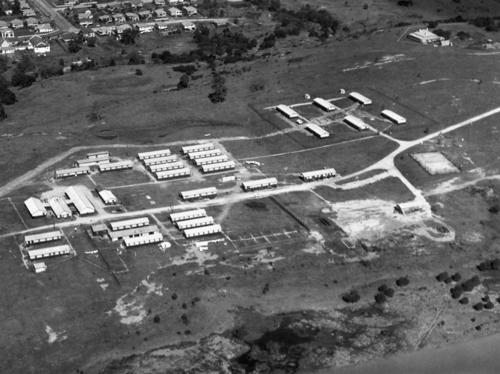 During WWII Kalinga Park was used as a staging camp and an aerial photograph can be seen below. 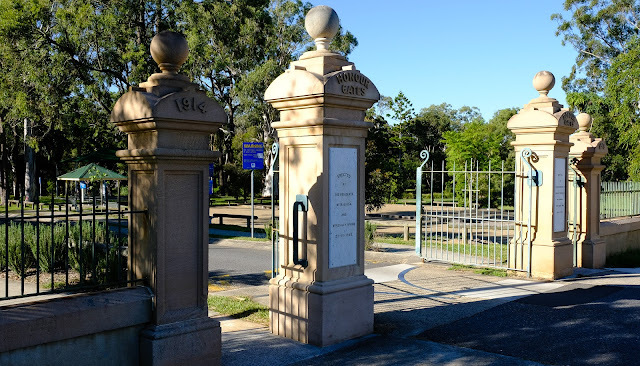 The solid Helidon sandstone gate-posts are still standing as sentinels guarding the park and are themselves protected by being listed on the Queensland Heritage Register. As we approach Anzac Day 2017 it seems that the world is moving closer to Armageddon by the minute. Not since the Bay of Pigs stand-off in the sixties can I recall such dire straits for the world. Unfortunately it seems that we have a number of belligerent leaders at the name-calling stage, and people of the world are holding their collective breath in the hope that the arguments don't turn more violent. One has to wonder at the failure of the world in general to learn its lessons from the past. There always seems to be a problem over who owns what, who believes what and who does what. If it were kids in a sandpit having a blue about who owns the bucket, who believes that a god lives in the sandcastle and who kicks the next sandcastle over, you would send them all to bed without supper. Unfortunately the stakes in this scenario are much, much higher. The humanitarian and ecological problems of the world will not be solved while territorial posturing continues and ever-increasing funds are being squandered on arms. Armed conflict seems to beset the world at various intervals, however given the quantity and the technology of current weapons the next major conflict could be terminal. 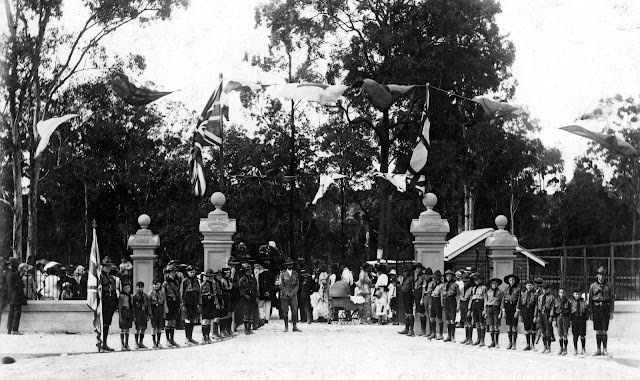 Why did Anzac Memorial Park lose its original name? We should be remembering the War To End All Wars now, not forgetting it. Not sure about the timing of the change, nor the reasons Hels. I agree that the ANZAC name could have been retained in some fashion. As always, a very interesting post... makes you wonder about the name change. I thought that once the name ANZAC was registered for a place, that it was for all time. Then again, in these days, is there anything that stays the same?